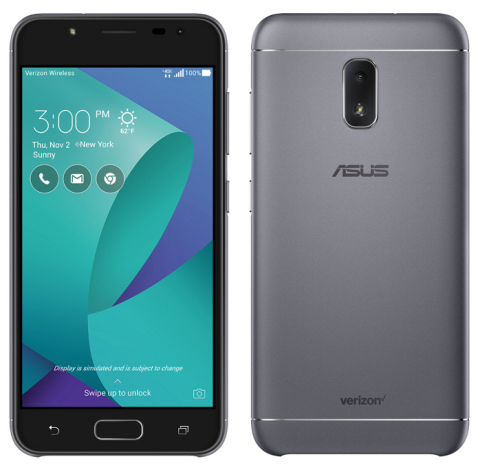 FREMONT, Calif.--(BUSINESS WIRE)--ASUS today announced the immediate availability of the Verizon-exclusive ASUS ZenFone V Live for $7 a month for 24 months on the Verizon device payment plan ($168 retail, 0% APR). The ASUS ZenFone V Live offers premium features such as a full-metal body, curved 2.5D glass and a fast and accurate fingerprint reader. It features built-in livestream beautification options for Facebook, Instagram and YouTube, allowing users to balance facial features, soften complexions and remove skin blemishes for worry-free streaming. The ASUS ZenFone V Live comes in a 16GB/2GB configuration and runs Android 7.1.1. It features a 5” 1280x720 HD display for 294 PPI with a 75% screen-to-body ratio. The Snapdragon™ 425 platform ensures that the ZenFone V Live’s 3000mAh battery provides multi-day battery life while also providing smooth performance when browsing the web and streaming videos. The ZenFone V includes premium features, such as a metal body design, curved glass and a quick fingerprint reader. It also includes a USB Type-C port, providing compatibility with the latest devices and accessories, and a SIM tray with a secondary spot for a micro-SD card of up to 128GB. The ZenFone V Live features a rear 13MP camera that provides class-leading low light performance and a 5MP front facing camera capable of clear and detailed livestreaming on Verizon’s lightning fast LTE network. The built-in Live Beautification for Facebook, Instagram, and YouTube make it extra easy to get the perfect look by offering options to adjust and control facial features, complexion and skin blemishes. The ASUS PixelMaster camera features low-light, beautification, super resolution, children, depth-of-field, panorama, slow motion and time-lapse modes for a multitude of ways to capture and share meaningful experiences. The ASUS ZenFone V Live is available exclusively on Verizon, America’s largest and most reliable 4G LTE network. The ASUS ZenFone V Live is immediately available for purchase at https://verizonwireless.com/smartphones/asus-zenfone-v-live, and in Verizon stores for $7 a month for 24 months on the Verizon device payment plan ($168 retail, 0% APR). ASUS today announced the immediate availability of the Verizon-exclusive ASUS ZenFone V Live.